From left to right, Dr. Mickey Rubin and Katie Hayes, ENC and Paul Sauder, Sauder’s Egg, PA. 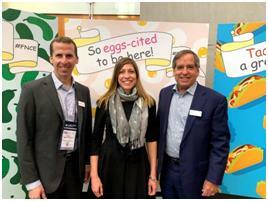 The Egg Nutrition Center, a unit of the American Egg Board hosted a breakfast event for attendees at the 2018 Food and Nutrition Conference and Expo. Special guest speaker was the chair of the AEB Member and Consumer Marketing Committee, Paul Sauder who provided a perspective on U.S. egg production.